What are ticks: Ticks are arachnids (spider) having four pairs of legs. The front two legs of some species develop into sensors. Ticks are the nature’s unique creation of parasites feeding on the blood of the mammals over the land, and some of their varieties live in the fresh water and also in the sea water. They normally have eight legs and having a different body shape. There are over eight hundred species and have three families. Of this, the first type of ticks has hard bodies and 2nd type possess the soft body, and third is the smaller version. 3) Nutalliellidae named after bacteriologist George Nutall. The fossil records of ticks show that they have been here for over 90 million years. The first two varieties transmit diseases to the humans. Nutrition: Ticks entirely depend on the blood of mammals to survive. They can live or fast a long time(up to a year) until a victim gets attached and finally die if they can not find a host. They developed and evolved over an extended period to adopt the method to feed on the blood. How do the Ticks Track to Attach: They take the time to search the prey and attach themselves to the victim. Usually, they attach to the thin and soft skin like ears and take between ten minutes to two hours to start their blood sucking operation. After drilling a hole in the dermis(skin), they excrete a substance as anticoagulant or inhibitor so that victim’s blood can not clot. To search the victim through the sense power, they use any of the prevailing conditions such as body heat, odor, moisture and then attach themselves. The larger ticks, climb on the branches or the grass to attach, whereas the younger ticks remain closer to ground to find their prey like birds, snakes, etc. Their olfactories are ever ready to guide, and they cling to or crawl or run the distance on the person of the victim. The hunter type species wait for the large mammal to come to their resting place before attaching and commence the operation.The ticks do not fly or jump. 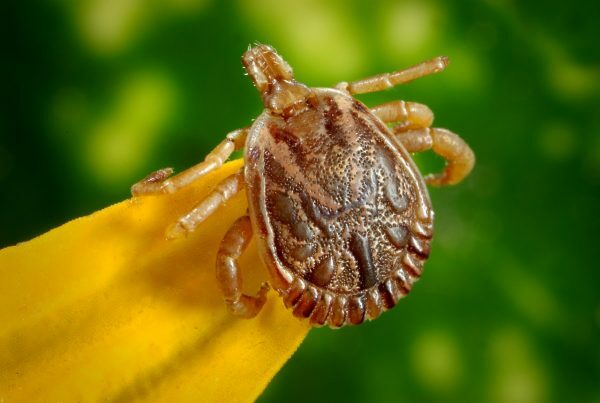 Signs of Ticks bite and physical problems: Depending on person to person with 1) rash or redness at the place of bite 2) paralysis, 3) swelling, 4) numbness, or 5) breath shortness usually people forget about the bite and not much to worry unless the ticks are infected. How to keep Ticks away: It is best to use the organic tick repellent easily prepared at home. All you need are three ingredients. 1)Garlic 2) Neem leaf extract and 3) Citrus. Have them cut or press them and crush about 10 grams each. Boil them in about 200 Mls of water when about 70 mls of the mixture is left sieve and collect in a bottle to get used soon.The chemical repellent is available in the market. One has to spend money, and of course, chemicals have side effects that are not desirable for one and all and the environment. Deer ticks: They are black-legged ticks known for spreading Lyme disease in the American Northeast covering central and eastern USA. Lyme disease in initial stages seems like flu if not treated by antibiotics but may give rise various health problems neurological disorders, heart palpitations, facial paralysis, acute headaches. Dog ticks: They are popularly known as hard ticks and found in central eastern USA. The mode of operation takes between 1-2 years. Ticks attach in three different ways in their growth from eggs to adult. : 1st stage: Female lays eggs on the ground in green vegetation. They molt and form larvae having six legs. 2nd stage They attach to the smaller mammals and live stocks. 3rd stage: They molt to eight feet and attain full size on molting. They mate and multiply by feeding on larger animals like livestock and pets, the males die after mating and females fall off to the ground to complete the third stage and laying the fresh eggs. The other ticks include seed ticks, ticks on humans, tiny ticks, white ticks, red ticks, small ticks, African ticks. The life pattern is same as described earlier. 1) Maintain the clutter free 2) Wash clothes at a high temperature above 130 F or 55 C 3) Vaccum your house regularly. 4)Treat indoor pets with organic repellent 5) In case the infestation is not successful all the professional exterminator. 1) Ensure all the greenery is kept well trimmed and especially the green grass. 2) Ensure the yard has plenty of sunshine – tick can not withstand the sunny areas.